Wow – what a parade season it was! First and foremost, thanks to all of the AOH Division 2 members who braved the elements to march with the Torphy Pipes and Drums during this parade season. It was our biggest season to date and we couldn’t be more proud to have marched with our brothers through Belmar, Rumson, Freehold and the Highlands. And a special congratulation goes out to our own, Rich O’Brien! He’s crossed over to the dark side after having completed his inaugural season marching as a piper with the Torphy Pipes and Drums. 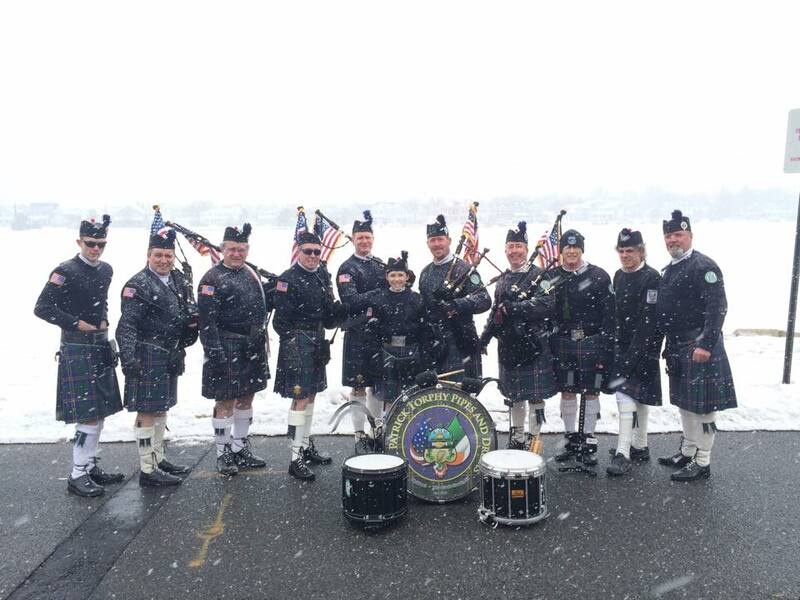 His first parade was Belmar and based on the weather conditions, some guys in the band felt compelled to give him a “code red” assuming he was the one who brought the snow and wind. Alas, cooler heads prevailed and we are proud to have him as a member of the clan. Well done, Rich and congratulations again – you made us proud! Did you happen to notice all those sweet band parade photos in the newsletter this month? Now is your chance to get in on the action so you can be in them next year! We’re always looking for new members to join the ranks. We offer free bagpipe and drum lessons for boys and girls ages 8 to 80, every Tuesday night starting at 6:30PM at the Bayshore Catholic Center. You don’t need any musical experience whatsoever (trust me!) and it’s a great opportunity to share Irish camaraderie, hoist a pint or two and give back to the community. Ask a band member for more information about joining or email Joe Donohue at rjdonohue@verizon.net for more details. The band proudly performs every year at the Middletown 9/11 Gardens, “Run with Dennis”, plus a variety of fundraisers and benefits for all.